Daisy and Violet are twin sisters who are born with “senses”. Sometimes, they know something is going to happen, not always when or where but just that it will. Daisy hates her senses, doing all she can to distance herself from her abilities, including moving away and changing her name. Vi loves them, eventually becoming a physic. Whilst the two sisters maintain a strained relationship, as they grow older, they grow apart. Theirs lives could hardly be more different and Daisy hardly more disapproving of Vi. Then, one day, Vi goes on local TV and says there will be an earthquake in their hometown of St. Louis. Her pronouncement sends Daisy into a tailspin and threatens the life she has built (which includes a husband and two children). At the same time, and as the day of the earthquake approaches, it draws her closer to her sister. What will they do if Vi is right? What will they do if she isn’t? And did I care? Not by the end, no. 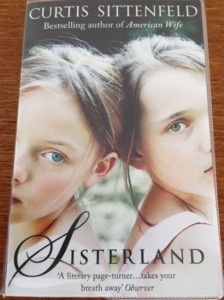 Sisterland has been on my reading list for a while, ever since it came out, because I loved American Wife and I grabbed it as soon as I saw it at the library. It may have been one of the reasons I was so disappointed because, whilst it started out well, it quickly lost my interest and I found myself reading it just to finish it, which I hate. Whether there was an earthquake or not just didn’t interest me anymore. The main problem, for me, was it was just too long and too detailed. The very thing that I found I enjoyed in American Wife, the attention to detail, the descriptions of events, bored me to death this time. Neither Daisy or Vi were interesting enough characters and their lives, despite the predictions are definitely not interesting enough. Everything about the book is repetitive. The situations, the behaviours, the language. It really is a shame because it could have been really good at 2/3rds the length. Not one I’ll be recommending. How disappointing! I was excited to see a new book by him. I enjoyed American Wife and Little Children very much. It’s on my to-read list but it’s a pretty long list. We will see.